Putting in place national laws with specific measures for police and other uniformed personnel to uphold women’s and girls’ right to live free of violence. Instituting national policies, strategies and action plans that set out roles and responsibilities of different security actors and are budgeted for implementation. Developing institutional policies, operational policies and codes of conduct to promote zero tolerance for violence against women and guide the work of police and other uniformed personnel in areas such as incident response, protection of survivors, investigation, and referrals. Local citizen security plans (adapted from Valasek, 2008). When developing legal and policy frameworks which mandate the security sector to address violence against women and girls, it can be useful to conduct an initial assessment to determine gaps in existing frameworks. It is also critical to monitor implementation of policy(ies) and conduct on-going impact assessments (Valasek, 2008). Source: Valasek, K. 2008. “Security Sector Reform and Gender.” In Bastick, M & Valasek, K. (eds.) 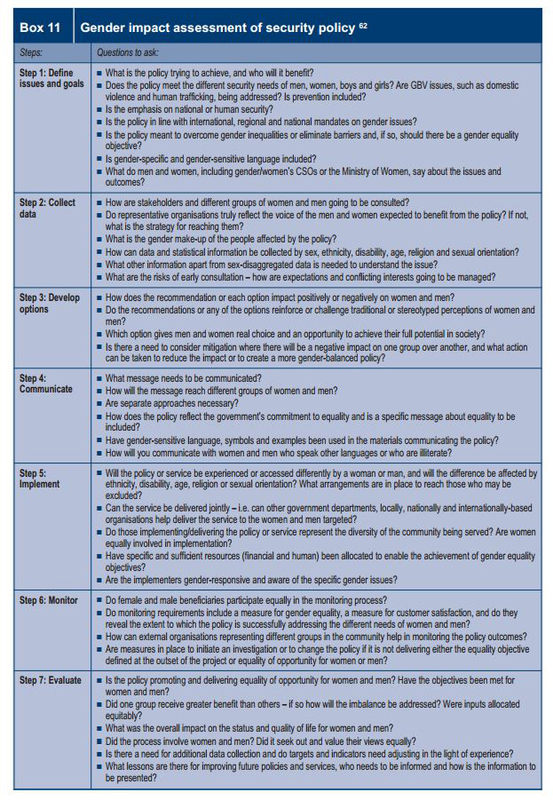 Gender and Security Sector Reform Toolkit, pg. 13. Geneva: DCAF, OSCE/ODIHR, and UN-INSTRAW. Example: Implementing SCR 1325 through National Actions Plans. Côte d’Ivoire has been experiencing political and military crises since September 2002. Its five-year 1325 NAP, covering the period 2008 – 2012, was designed under the lead of the Ministry of Family, Women and Social Affairs (MFWSA), with the collaboration of various other relevant ministries. In January 2007, UNDP, UNFPA, the Gender Unit of the UN Operation in Côte d’Ivoire, UNIFEM and the government of Norway launched a project to provide technical and financial support to the drafting and implementation process and to support civil society organisations involved in gender issues to participate in the 1325 NAP process. Under this project, training on SCR 1325 was conducted for government officials, locally elected representatives—especially mayors and general counsellors--and civil society organisations. Côte d’Ivoire’s 1325 NAP contains a detailed overview of the gender-based insecurities that women and girls in Côte d’Ivoire face, including internal and external displacement, prostitution, sexual violence and assault. It also acknowledges that security sector institutions face problems such as corruption and politicisation of the judicial environment, and that there is a lack of training for the police and the gendarmerie to deal effectively with victims of sexual violence. These problems are impeding efforts to effectively address the gender-based insecurities of women and girls. Recognizing the importance of addressing women’s needs and including women in all development sectors, the 1325 NAP states that the implementation of SCR 1325 is a national priority. As such the 1325 NAP constitutes a consensual framework for reconstruction, reconciliation and sustainable peace in the country. A prominent feature of Côte d’Ivoire’s 1325 NAP is that it sets out a logical framework of indicators for a chain of results linked to each of its four priority areas (see pages 27-33), offering a platform for monitoring and evaluation of progress. Each priority area includes 6 -12 actions and three different types of results - “strategic results”, “effect results”; and “output results”. For each of the actions, a responsible party and a reporting method are identified. The logical framework also identifies risks and defines output indicators, verification sources and verification means for each of the desired results. Moreover, the 1325 NAP includes a five-year budget plan broken down by activity (adapted from DCAF, 2011, pgs. 68-70). Example: Post conflict needs assessment in Liberia. Source: adapted from DCAF, 2011, pgs. 86-91. Gender and Security Sector Reform: Examples from the Ground (The Geneva Center for the Democratic Control of Armed Forces (DCAF), 2011). Concrete illustrations of ways in which a gender perspective has been integrated in different security sector institutions and security processes around the world. They can help policymakers, trainers and educators better understand and demonstrate the linkages between gender and SSR. Available in English. Gender and Security Sector Reform Training Resource Package (The Geneva Center for the Democratic Control of Armed Forces (DCAF), 2009). This Training package provides practical training materials on Gender and Security Sector Reform. A companion to the SSR and Gender Toolkit, the Training Package is designed to help SSR trainers and educators present material on gender and SSR in an interesting and interactive manner. It contains a wide range of exercises, discussion topics and examples from the ground that can be adapted and integrated into other SSR trainings. Available in English. See also the Legislation Module.